July already? Well boys and girls, you know what that means… Comic-Con! I’ve been attending the annual pop culture fest for more years than I care to remember, and owe a large chunk of my sublime collection of Weird & Unusual Things to exhaustive hours wandering the darkest corners of the cavernous exhibition hall. Without Comic-Con, many of my very best photos would not have been possible, as the exhibition hall has been the source of everything from Frankenstein flashlights and lascivious lobby cards, to plastic body parts and scandalous paperbacks. How was the shopping at this year’s event? Hold on tight as we snake our way through the costume-filled aisles and take a look at some of the wonderful things that tempted (and sometimes defeated) my wallet! 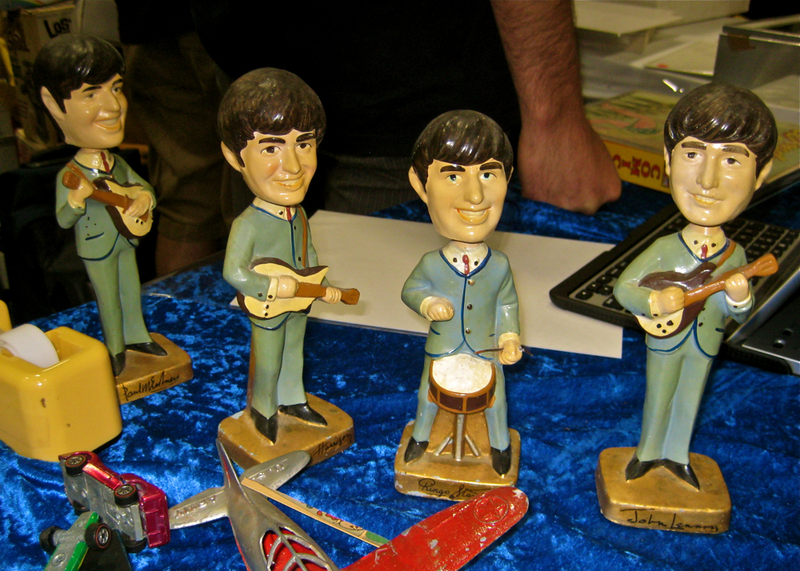 Original Beatle Bobbleheads — $950!! Our first stop is at a vintage booth near the front of the hall where I spotted the above set of original Beatles bobblehead dolls from the early 1960’s. Those of you familiar with my photography have no doubt seen the smaller (and far more sadistic looking) version of these dolls in many of my conceptual art pieces (examples here and here). This figures are much larger, and actually bear a reasonable resemblance to the Fab Four. Best of all, they were RIGHT THERE on the faux velvet tablecloth where anyone could pick them up or tap their bobbling brows to watch them nod along to whatever Beatle classic that might be floating through your head. Under those circumstances, and with the really good stuff saely locked up behind glass… how expensive could these really be, right? Try $950. There. On the table. No, I did not buy them. But I did make their heads bobble. Ooooooooooooooooooo! Having just saved myself almost a thousand dollars, I was now empowered to seek out more reasonably priced collectibles and ventured into one of the dwindling few booths that still sell vintage pulps and paperbacks. There, I was very excited to feast my eyes on the incredible paperback to the right. Oh wow!! Just the kind of thing I would buy! Well, except for one problem, quickly corrected as I fumbled for my reading glasses to better make sense of the price sticker. $50?!?! Hopes dashed! Magnificence shattered! Desire unsatisfied! To collect as much information on the book as possible, as the search now begins for a more affordably priced copy. The author… John Erskine! Coincidence of coincidences, John Erskine was the author of another amazing book that just so happens to be a feature player in my most recent photograph!! Is it any wonder that Erskine wrote The Influence of Women… and its cure, after putting Helen of Troy in a Victoria’s Secret catalog? Quick! Run with me from this booth before reverse buyer’s remorse gets the best of me! Mystic Seer fortune telling machine! OH MY GOD IT’S A MYSTIC SEER MACHINE!!!!!!!!!!!!!!!!!!!!! Just like that famous Twlight Zone Episode starring William Shatner (Are we going to live in this country?). They actually worked and dispense fortunes on specially printed Mystic Seer cards. How long have I wanted—no, needed—a Mystic Seer machine of my very own? 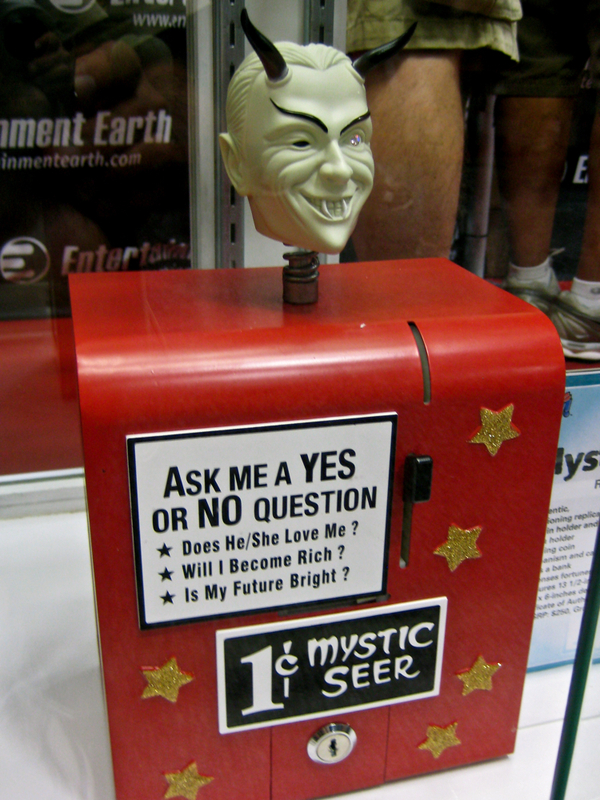 Wait, that’s not a Yes or No question and the Mystic Seer would be of no use. Let us rephrase: Would a Mystic Seer machine make my life even more wonderful than it already is??? The answer, of course, would not be the usual read-what-you-will mystic ambiguity; it would be a resounding YES! Oh… but as you can see from the photo, the Mystic Seer was locked up in a glass case, and that spells dollar signs that would require an affirmative response to question number two on the boldly printed examples. Worse, to the left of this traditional red Mystic Seer was a limited edition silver model (signed by William Shatner, by the way! ), and while any color but red could not possibly be trusted to lend guidance on one’s mystic journey, the mere presence of a limited edition model had to add up to big bucks. In this case: Glass Case = $250 for the red model, or $500 for the limited edition. So, no, I do not have a Mystic Seer sitting here beside me that—for the bargain price of a copper penny—would be able to predict whether or not you, the reader, are enjoying this post. I just have to wing it. But I will, someday, have a Mystic Seer. It seemed as though collectibles from my distant youth were popping up to tempt me in every aisle of the exhibit hall. Everywhere I turned enticements plucked at the strings of my memory, calling out, “Hey! Remember me? You like me! You want me! Buy me!” There were DVDs of old TV shows, vintage toys, horror comics I remember buying (without telling my parents) off the rack in Mission Beach, and… our friend to the left: The Creature from the Black Lagoon. Last summer I wrote a collection of posts on “Really Scary Things,” but completely neglected to mention the Creature! 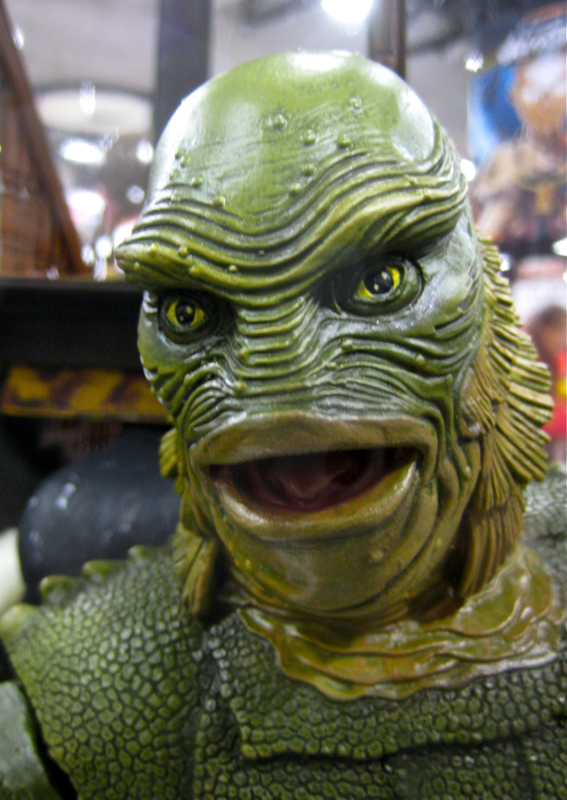 When I was a kid, the Creature from the Black Lagoon was the ultimate monster! All it took was one wide-eyed viewing of the original 1954 film on Science Fiction Theater—San Diego TV’s Saturday afternoon horror show—and I was hooked! The Creature was gross and scaly, and breathed through bellowing gills. His webbed hands were HUGE! The size of canoe paddles and tipped by razor sharp claws. He was inhumanely STRONG, and was relentless in pursuit of his startled prey. I thought the Creature was AWESOME! But he was also kind of scary because, you know, monsters could be real, and we happened to live up the hill from a large lake that didn’t look… all… that… different… than… the Creature’s Lagoon! So, yeah, I was fascinated by the Creature—but also scared and a little freaked out by the Creature. And isn’t that what makes all the best horror work? Incidentally, just in case you’ve never seen Creature From The Black Lagoon, it may have the most immediately identifiable “monster movie” score of all-time. Yeah, that’s exactly how it goes. See for yourself. Back to the scaly fellow above who was trapped in a glass case on the convention center floor. When I was a kid I had a Creature from the Black Lagoon plastic model kit that I built and painted (badly), to honor my favorite movie monster. Really though? What am I going to do with a giant bust of the Creature? My home decor is adventurous, but tasteful, and I’m afraid a giant green amphibian cast would push me beyond “edgy” into full-on weirdness. 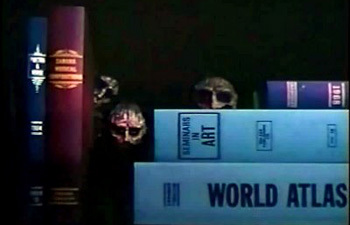 Besides, I already have a small Creature on display in a bookcase along with his Universal monster friends. I have no idea what he cost, but it was an easy decision to pass on my beloved Creature. Original Major Matt Mason — Not for sale! Another icon from my past is pictured to the right: Major Matt Mason, on display—and not for sale!—in the toys-of-yesteryear section of the Mattel booth. 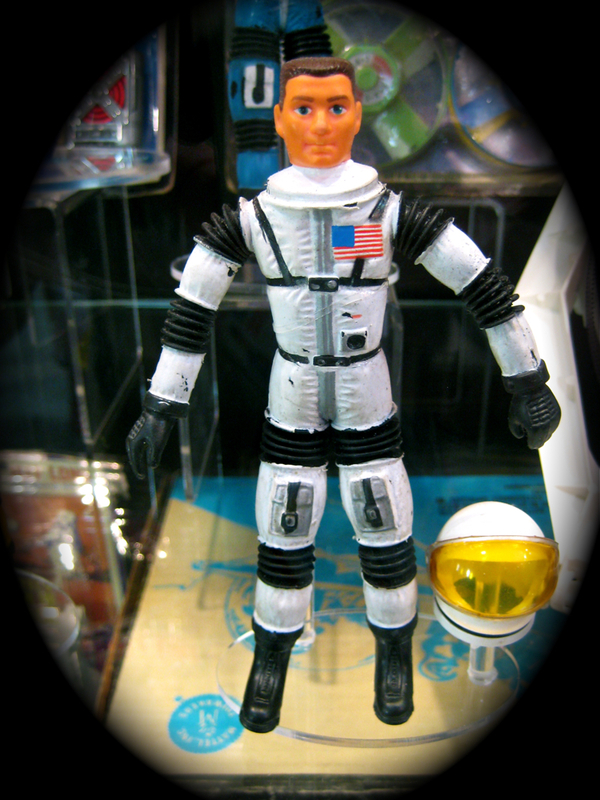 Matt Mason was an awesome toy figure created during the space race before man had actually landed on the moon. How cool was Matt Mason? He had a jet pack! That’s right—a jet pack! Everyone is always complaining that “we were promised jet packs.” Well, Matt Mason had one! Okay, in reality it was a doo-hickey that attached to his back that zipped along on a string… but if you had any sense of imagination, IT WAS A JET PACK! 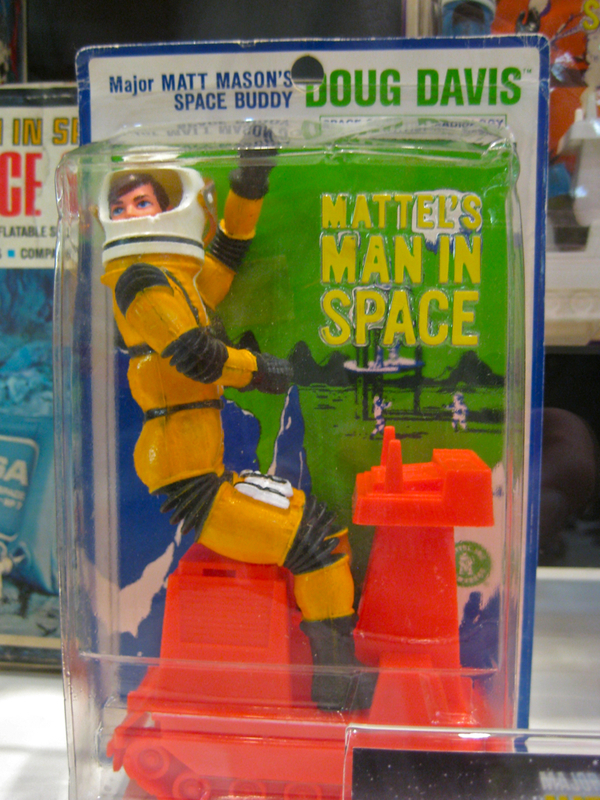 Beside the jet pack, Matt Mason was cool because he had posable arms and legs. See the black accordion things in the photos? The accordion joints allowed his rubbery spacesuit to bend and remain in position. In reality, Major Matt Mason was filled head-to-toe with a substructure of stiff wire that sooner or later either broke (resulting in limp limbs) or poked through the rubber turning Matt into a saber wielding space maniac that could scratch and puncture the delicate flesh of his adolescent astronaut cadets. Mattel had all kinds of Major Matt Mason figures and accessories on display in pristine condition. I rarely see Matt Mason figures anywhere—including Comic-Con—so it was a delightful treat to see him standing inside the glass case with his trusty space helmet at his side! 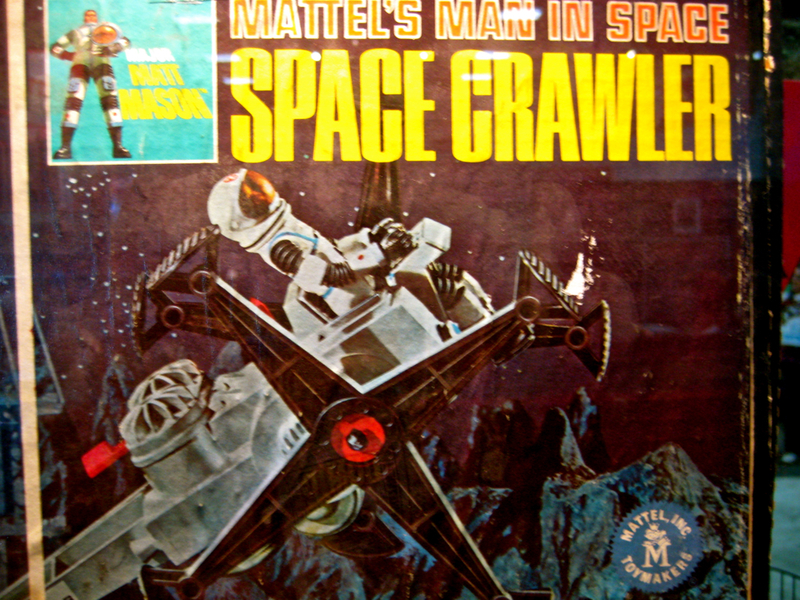 Amidst the menagerie of space stations, moon suits and space sleds were a pair of Major Matt Mason accessories I had as a kid: the much coveted ATV Space Crawler and one of Matt’s space “buddies” (?!?) Doug Davis riding his Space Tractor. Each of Matt’s fellow astronauts wore a different colored suit and Doug Davis wore yellow. The all terrain Space Crawler! No, Major Matt Mason was not for sale, and that was probably a good thing, locked glass cabinet and all. After the Beatle Bobblers, the jiggling Helen of Troy, the Mystic Seer (whose demonic head bobbles, by the way), and the Creature cast, could I bear yet another incident of exhibition sticker shock? Or would the temptation break me? Would I make a mad dash through the hall, filling my arms with limited edition wonders, as gleeful vendors stripped fat rolls of greenback from my pockets? Surely, Comic-Con 2012 could not pass without me making a single pop culture purchase; could it? To learn the answer to these and many other crucial, overly dramatic questions… stay tuned for Part 2! 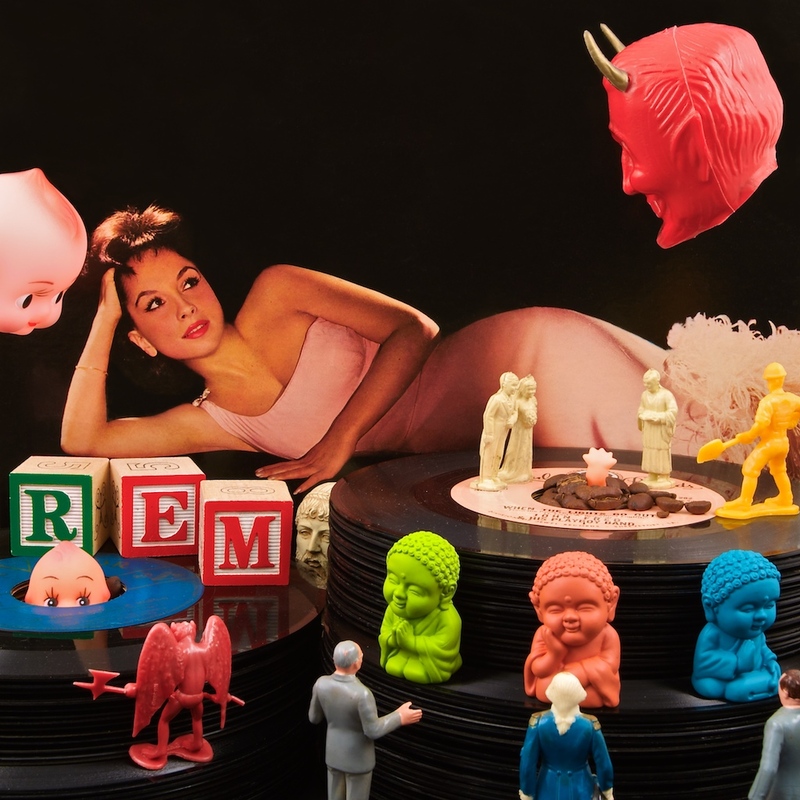 Vintage Vinyl and other Really Cool Stuff! I’ll be the first to admit that I don’t post new blog entries anywhere near as frequently as I would like. Ideally, I’d be blogging on a daily basis, sharing news about new photos and videos, art exhibits, great books, cool records, and posting articles that dive deep into my creative process. Trouble is… I have a difficult time churning out prose without laboring over every word, sentence and paragraph. Plus, just to make matters a little worse, I can’t… stop… writing. Simple topics—hey! I like this record!—turn into exhaustive (but still, of course, interesting) accounts worthy of a short chapter in a book. Yes, it’s a problem, but now… a solution! 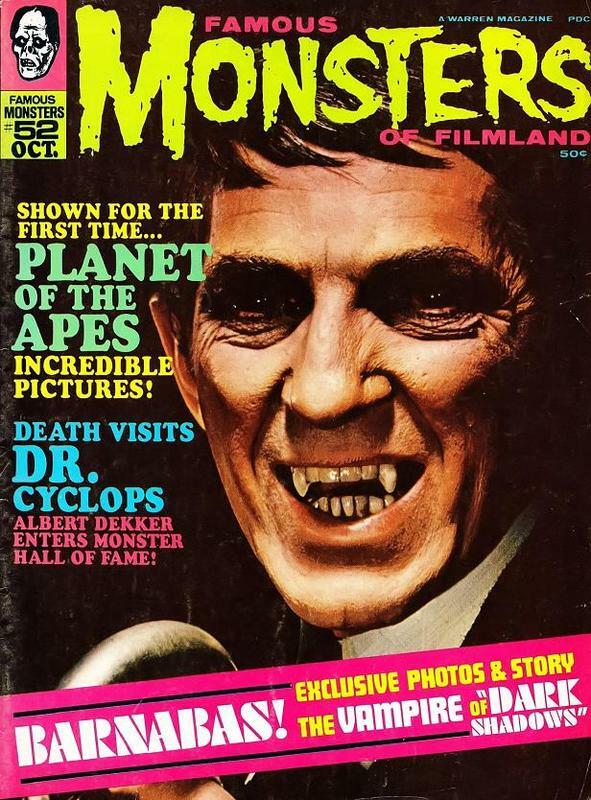 RIP Jonathan Frid—the “real” Barnabas Collins! While the Tumblr focuses on cool vinyl records, in recent days we’ve also made posts on awesome art, vintage advertising, weird toys, pulp novels, and outer space. I hope you enjoy this foray into more frequent sharing of interesting things, and if YOU have a Tumblr, don’t be shy… feel free to reblog any of the images you find on Vintage Vinyl. We’re scouring the universe for cool finds to share with our followers, so let us know about your interesting finds! I started out this post—the fourth in my continuing series on Really, Really Scary Things—intending to reflect on a bunch of frightening movie scenes that left their collective shivering impressions on my surely scarred and damaged soul. However, as I dove into the subject and began to write my “Recollected Tales of Cinematic Terror,” I quickly realized that the post was becoming dominated by my reaction to film adaptations of Steven King novels. So, switching gears and in the spirit of posting sooner rather than later, my Scary Scenes post is being recast as a Stephen King post. Fear (?) not; I promise that all the other heart pounding scenes of eye-popping terror will be covered in a later post. Stephen King has the reputation of being the preeminent writer of horror. I suppose that’s an adequate layman description, though it places his work in a tight little genre box that a lot of people won’t touch. I remember standing in line at a bookstore around the time that It was released in 1986, and getting in a rather ludicrous argument with the old codger behind me who pointed to the “coming soon” poster and commented to his wife that he “…could tell that book is a piece of garbage.” Troublemaker that I am, I asked him if he’d ever read anything by Stephen King, to which he answered, “No, I don’t need to. Just look at the cover.” As someone who enjoys collecting life experiences of the Truly Stupid, the irony of this exchange in a bookstore was rewarding. In any case, I personally don’t find the majority of King’s exceptional body of work to be super scary. Rather, he tells really, really good, riveting stories based on circumstances (call them supernatural, if you will) that we don’t often encounter in the “real” world. I enjoy immersing myself in his vividly told stories, and savor the creepy moments, but I’m rarely sleep-with-the-lights-on scared. Those moments, for me, have been more likely to occur in the film adaptations of his earliest novels. Let’s turn on the projector and dare to take a peek! Carrie in her lovely prom ensemble. 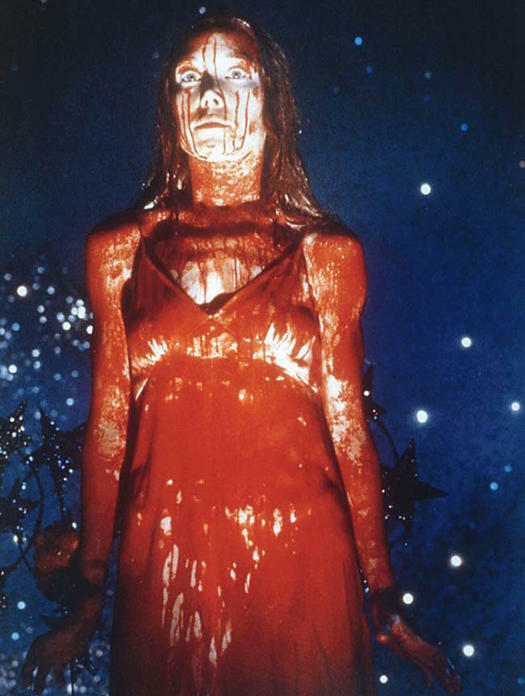 Carrie was the first of countless Stephen King adaptations to hit the silver screen, and for my money it’s still one of the best, garnering Oscar nominations for Sissy Spacek and the delightfully deranged Piper Laurie. It smartly stayed close to the original novel, and had lots of creepy visuals (Sissy Spacek drenched in blood, staring down her classmates like a crimson statue of hate; Piper Laurie hiding behind a bedroom door clutching a 12″ butcher knife—good stuff!). The first time I saw the film, I really didn’t find it all that scary. I’d read the book, so I was well prepared for the eventual rampage of telekinetic revenge, and that played out—for me—with more satisfaction than fright. So, yeah, the fires rage, the house implodes, Carrie is dead and the movie is over. I thought it was good. And I didn’t think it was scary. Oh wait, the movie isn’t over. Susan Snell, the lone survivor of Carrie’s Prom Night of Death is carrying a bouquet of flowers. This isn’t in the book, I think. And then… the final scene. Is it possible to have every ounce of blood suddenly evaporate from your entire body? I think that’s what I experienced, and—with the frenetic score and Amy Irving’s screams—it’s quite possibly the most frightening thing I’ve ever seen on film. The Shining – Dead little girls are SCARY! 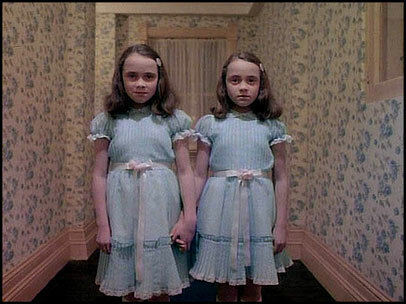 While Carrie was a reasonably accurate retelling of a Stephen King novel, The Shining is notorious for the “liberties” Stanley Kubrick took in directing his 1980 film adaptation. Yes, the book and movie tell the same basic story, but they do so by radically different means, and while King has been famously critical of the film, I think both are successful at delivering really good scares. I will forever be scared of really long hotel hallways with ugly carpeting. 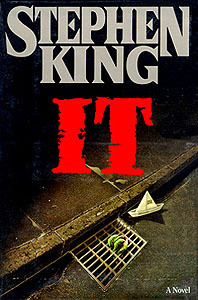 One more early Stephen King adaptation before we move on to other horrors. I give you now Salem’s Lot and the best screen vampire since Max Schreck in Nosferatu. ‛Salem’s Lot (yes, there’s a leading apostrophe in the book title, but not the movie) was a really, really scary book about vampires slowly infiltrating a small town in rural Maine. It seemed perfect for a screen adaptation and originally aired as a two part miniseries in the fall of 1979. Despite what I thought to be some really cheesy casting (David Soul? Lance Kerwin? ), the series, as a whole, was one of the best things I’ve ever seen on broadcast television, and was filled with the kind of eeriness that creep into your subconscious late at night to screw with your rational mind and leave you with the lights blazing until daybreak. One role that was masterfully cast was that of antique dealer Richard Straker, played with supercilious big city euro-arrogance by James Mason. So superb is Mason in this role, as he plays down to the unsophisticates of the quaint little town, updating them on the impending arrival of partner, “Mr. Barlow,” that you just know something really, really bad is headed for the town of Jerusalem’s Lot. Waiting for Mr. Barlow to arrive, we the viewing audience are treated to floating dead children, freshly buried dead children, and various other scares, but NOTHING like the first screen appearance of Mr. Barlow. With town hothead Ned Tebbets cooling off in the local pokey, his dimly lit cell is disturbed by strange shadows fluttering upon his face from beyond the bars. Ned, restlessly swats at the shadows, then awakens to see a mysterious shrouded arm unlatch the iron bars with the wave of a boney hand. And then… Hello, Mr. Barlow! Undead, foul-mouthed, murderous toddlers are REALLY scary! Didn’t I earlier boast that I’m rarely truly frightened when reading Stephen King? Oh, sure, there are hair-raising moments across his entire canon of well-told tales. But seriously, psychologically messed up from reading words on the page? Nah. Well… there was one book. 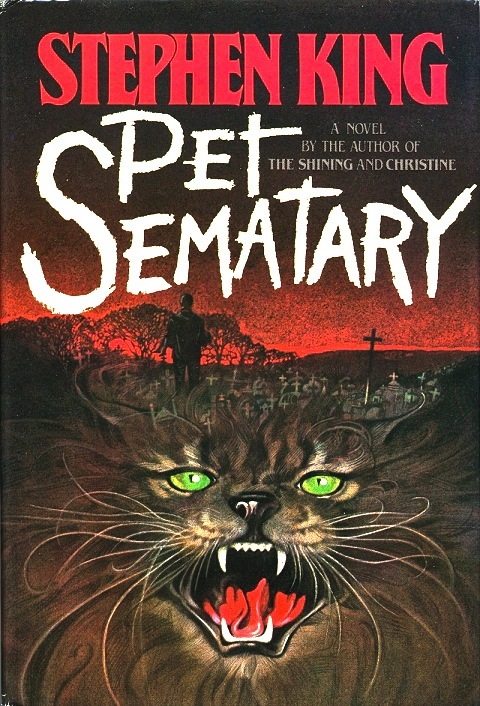 Released in 1983, Pet Sematary was supposedly a story that King himself found so extreme in its themes and consequences that he originally held it back from publication. Naturally, I wanted to read it! The weekend following the book’s release my parents were to be out of town, leaving me home all alone at their secluded house in the country. Who are you kidding? The house isn’t “secluded.” Yes, it’s off the street and sits on two and a half acres, but that’s certainly close enough for neighbors to hear your screams in the event of an attack by the undead! Yeah, okay, whatever. This is my dramatic blog. So… Alone. Secluded. There was also a rather nasty, blustery storm brewing so I set out to read what was supposed to be One Scary Book. And it was! Raising the dead is only so scary, but when the dead come back “not quite right” with wicked, nasty, spiteful intentions… that’s downright unsettling. There were all kinds of memorably creepy scenes, the most disturbing being that of a distraught father robbing the grave of his freshly buried son, a precocious little toddler named Gage. It’s really pretty frightening, and heartbreaking (which really makes the horror that much more effective). Little Gage comes back as if possessed, going on a killing spree in which he taunts his victims (notably, about the sexual proclivities of the neighbor’s long deceased wife), and commits matricide. I read the entire 400+ page novel over the course of two nights as a storm raged outside. The book was so scary that on the second night I just kept reading and reading because I was frankly too scared to go to sleep. And to stop reading would be to leave the horrifying and suspenseful tale hanging, unresolved, to play with my overactive imagination. Page by page I allowed the story to fill my mind, until the book came to its unsettling conclusion. Then, I had to go to bed. I had a bedroom on the second floor above the garage, and I can’t recall how long it took me to finally fall asleep as the book sat on my nightstand and the wind howled outside my window. Nor can I recall what I dreamt that night. But sometime in the pitch of darkness I was awakened by a banshee wind shuddering at my window, and the large umbrella tree that covered the back patio was suddenly taken up and smashed through the window on the other side of the room. Hi there boys and girls! Gather round and let’s play a game! YOU ARE ALL GOING STRAIGHT TO HELL!! Yes, I grew up Catholic. I went to parochial school where I was taught by nuns dressed collar to toes in black habits. I was also an altar boy, and served mass for brash Irishmen of the clergy—free drinking Jesuits, more likely to dive headlong into a bare-knuckle whiskey scrap than fall prey to modern day indiscretions. 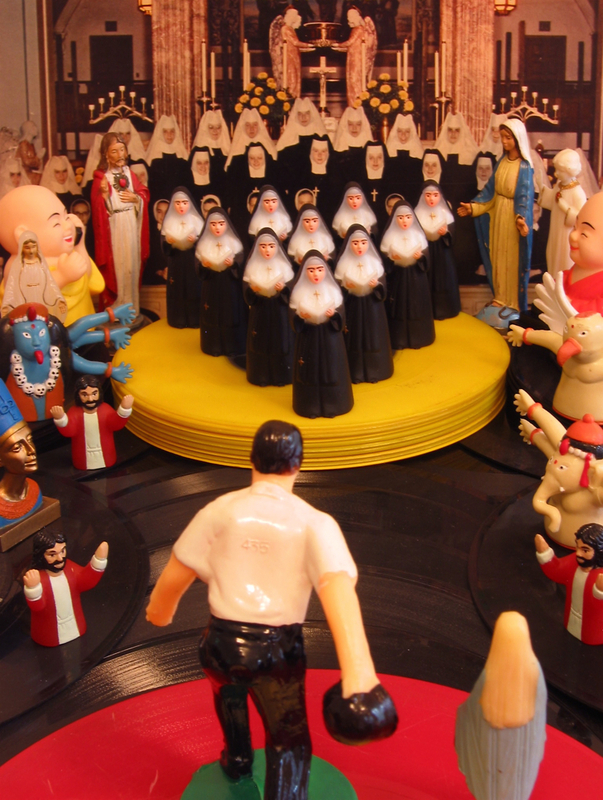 The lessons taught by the nuns and priests provided heavy doses of consequences and guilt, where punishment for potential wrong-doing was sternly described in wary terms of “or else,” rather than the vivid Bosch-esque images of torment you may imagine. Implied damnation can be so much more effective than the real thing. 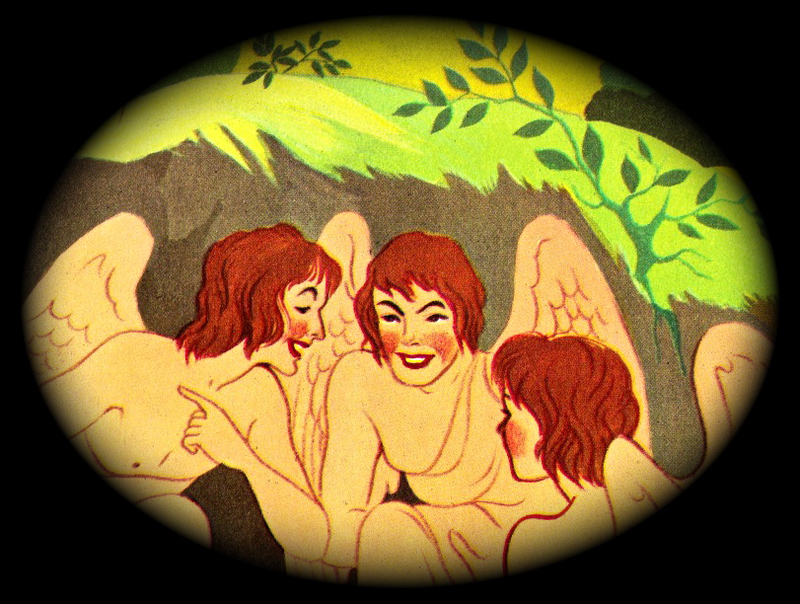 Besides, the priests and nuns really didn’t need to describe the torments of hell. Not when they had effective teaching aids to scar the Holy Hell right out of your soul! One such teaching aid was a monthly magazine that parents could subscribe to for their kids. Catholic Children’s Treasure Box – so wholesome! 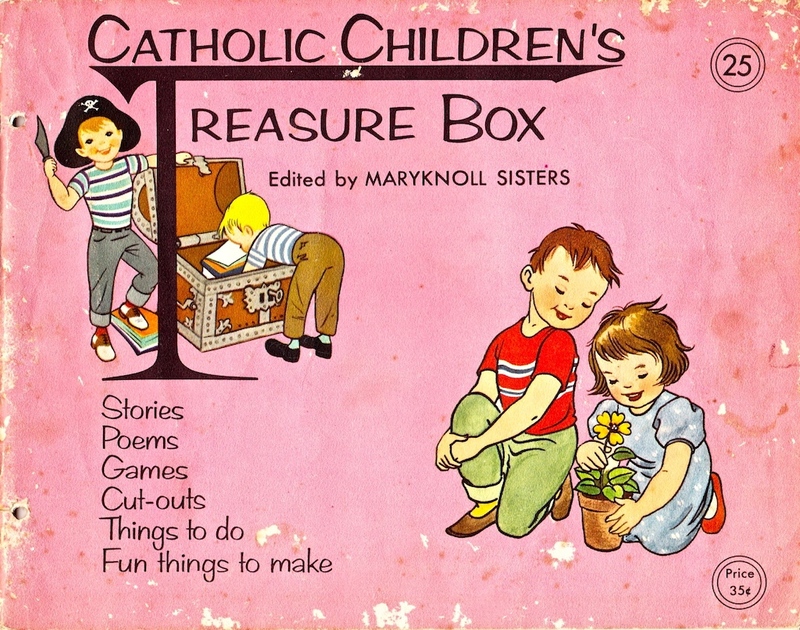 The Catholic Children’s Treasure Box was published monthly by the Maryknoll Sisters, and each issue was chockfull of games, activities, and Bible stories about children who obeyed their parents and had all of the good graces of God. Just look at how happy those children are in the cover illustration above! Issues of the Treasure Box were handed down from my oldest sister Gina, to my sister Marianne, and eventually to me and my brother. I LOVED pouring through the Treasure Box each month, and spent hours and hours engaged with their simple activities and reading the wholesome stories. 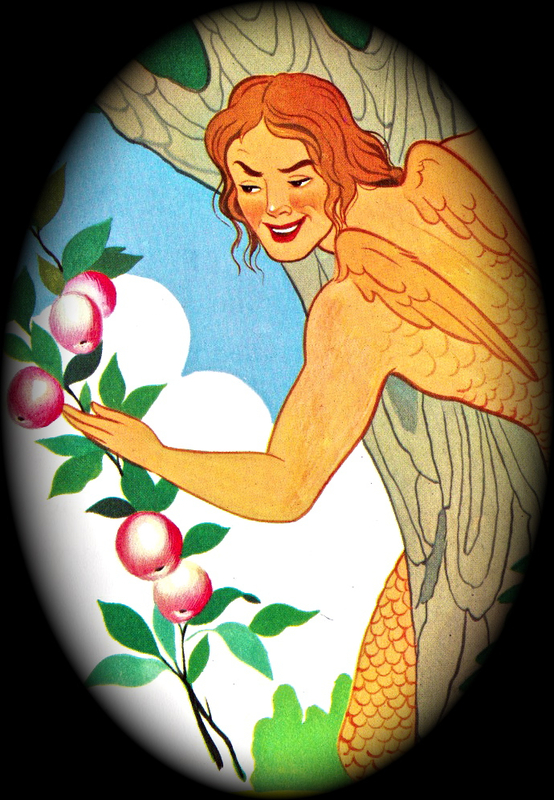 There were stories about Adam and Eve, Saint Theresa, a mischievous guardian angel named Wupsy, and then…. OH MY GOD! THIS DEVIL SCARED ME!! Encountering images of devils, demons, fallen angels and the like was not at all uncommon throughout the pages of the CCTB; the story of Adam and Eve, in particular, was like a hornets nest of demonic illustrations. But where those devils were clearly drawn with evil intent (sly prankish grins, orange skin, reptilian wings), they at least looked somewhat human. This devil was nothing of the sort. Flaming hair! Red eyes! Warted nose! Pointed tail! Spots! And scaly, sharp toenails! This devil was far, far too much for my impressionable five year old psyche to bear, and my mind commenced to imagine this Orange Haired Devil lurking everywhere. I envisioned him not just standing behind walls, but actually living within the brick and mortar, plotting and planning, biding his time and collecting his wicked thoughts. Surely, he waited for just the right moment to reach forth a scaly hand to pull me screaming into the fiery depths below. I didn’t dare sleep with my back to the wall! How would I ever see his fingers materializing through the wallpaper if I was not duly vigilant? But to face the wall was to face his glowing red eyes emanating from the wall, watching and waiting until I drifted off to sleep. What was a kid to do except run to the protective safety of mom and dad’s room!?! Eventually I got over my fear of the spotted devil and his many minions of tempestuous troublemaking brethren. 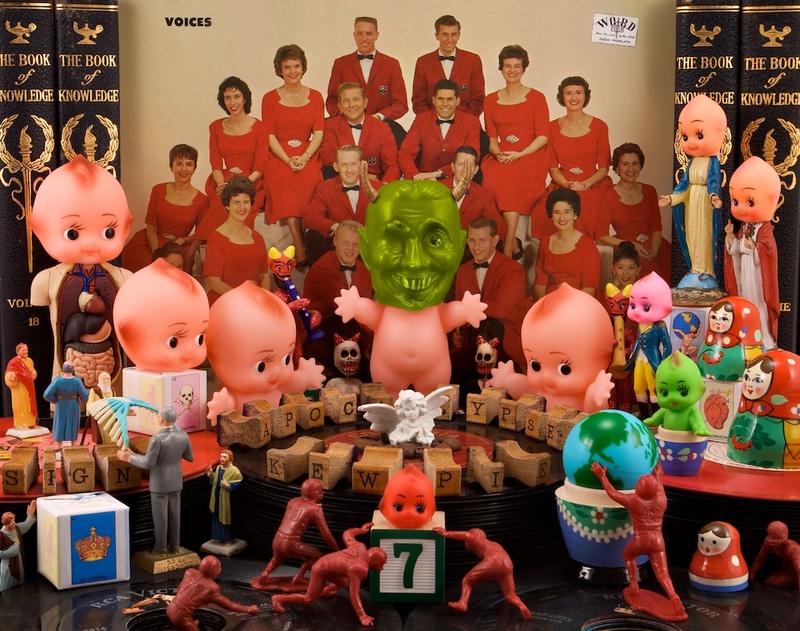 In fact, a quick perusal on my fine art photos would likely reveal that—next to my ever adorable kewpies—devils probably take second billing of recurring characters that appear throughout my work. I put them in photos; they don’t reach through my mattress and grab my ankle. Seems fair, yes? 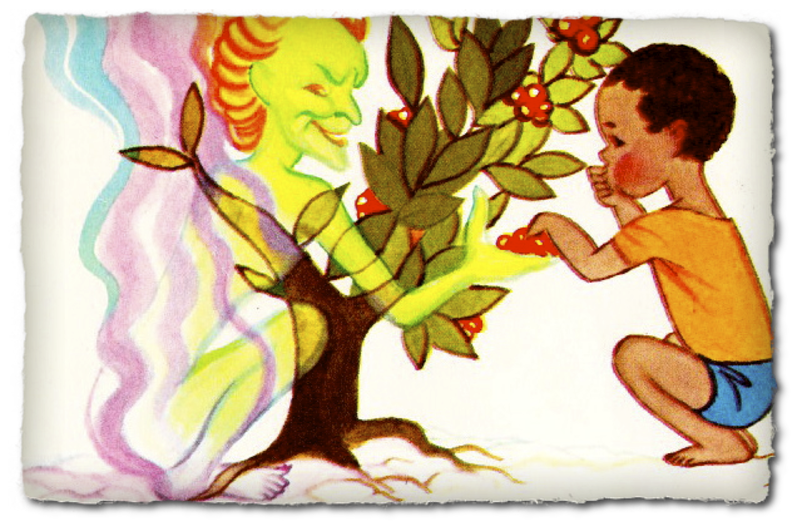 And, to close, let’s all enjoy Unbeknownst to her Creator, Eve longed to become a cheerleader—wholly inspired by the words that filled my adolescent imagination as I read the Catholic Children’s Treasure Box. What terrified you as a child? Don’t worry, your disclosures won’t be shared with Satan. I can’t remember the name of the movie, or anything else that happened, but that one part really freaked me out. Rarely are these memories linked to the entire feature length film. Rather, select scenes that packed such a psychological wallop as to have left a lasting impression of unpleasant bewilderment. 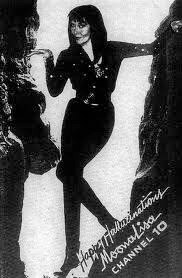 The film library in my brain is filled with similar cutting room floor memories, having grown up watching badly dubbed Italian horror movies (all hail Mario Bava, who we’ll save for a future post) on Saturday afternoons, where our local “movie macabre hostess” was a horror-pinup named Moona Lisa. These scenes play out in short vivid trailers of disconnected horror. No characters, no plot, no title. Just pictures that move in my mind, and the spine tingling shivers they raise in my memory. Over the years I’ve grappled with these small doses of terror, trying to connect the memories to their source, and when I do connect a clip of gray-matter celluloid to a film title or TV episode…. Oh, the elation!! It’s like solving a lifelong riddle. We may all aspire to conquer our fears, but I’ll settle for merely making sense of them. And what do I see when the little film festival of fright clicks up a scene or two in my mind? 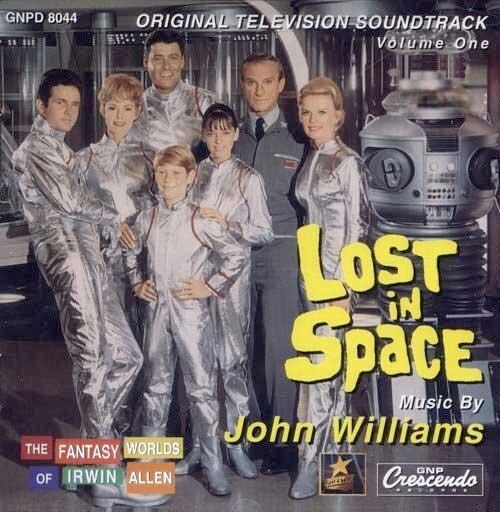 One very early memory is a scene from the first season of Lost In Space. Now, before you jump to dismiss the possibility of finding fear in such classic camp, go back and watch the first few episodes. The pilot, in particular, is high tension suspense, and the first season was a nice mix of disarming comedy and creepy Sci Fi terror, carried forward by a pretty awesome score (by John Williams, no less!). Yeah, the series became a silly parody of itself, but to a very young mind… the galactic perils of the family and crew of the Jupiter 2 were REAL! One scene in particular completely freaked me out. I remember a character walking amongst the boulders and dirt on the surface of a planet, when he comes upon a patch of alien vegetation that suddenly bursts to life as wriggling, squirming petals and tendrils; cooing and shrieking as if they wished to ensnare a person in their slimy grasp. Growing up, we lived out in the country on 2 1/2 acres of… boulders and dirt… and PLANTS! Though I loved exploring and climbing the rocks, I would not go anywhere NEAR a rock that was close to a plant, convinced as I was that the plant would spring forth and drag me kicking and screaming into the earth. The memory of that scene had no context, and I have no idea what the rest of the episode might have been about, but that image of a suddenly ravenous plant “stuck” in my brain. Decades later, and thanks to bootleg tapes purchased at Comic-Con, I rediscovered the scene in episode 15 of the first season titled, appropriately enough, Attack of the Monster Plants. In my last post I began by writing about the moment of mounting dread I felt while sitting in a theater Sunday afternoon. 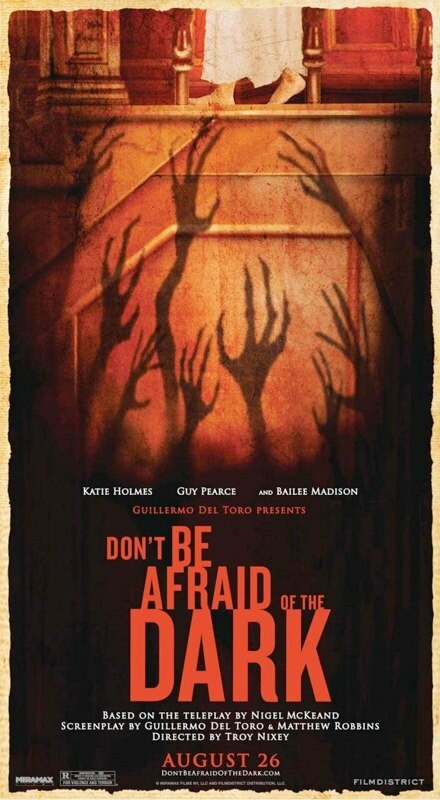 The movie I was seeing was Don’t be Afraid Of The Dark, the new film written and produced by Guillermo Del Toro. I really didn’t know much about the film, apart from its association with GDT, so I mostly went into the film cold. As the story unfolded, I began to sense something very familiar that tapped at my vault of childhood horrors with the clack-clack-clack of an old and rusty skeleton key. I soon realized that I was watching a remake of far and away the CREEPIEST film I ever saw as a kid. My whole life I’d been haunted by memories of a truly frightening film I saw on TV that involved tiny demonic creatures tormenting a woman from the vents and dark corners of a very old house. I’d long ago forgotten (or maybe never knew) the title, but remembered the creatures and a very scary pit hidden behind a secret wall. The creatures, as I remember them, were terrifying! Through most of the film they were only seen as quick, look-away flashes; their looming presence felt through late cuts, rapid movements, and ominous sound. For a split second they were—There!—only to vanish as the eye plays tricks and the camera is late to the hunt. When finally revealed, the creatures were horribly mutated and prunish, with cruel faces and hateful eyes. They spoke in manic whispers of insanity; their intent obviously wicked and amoral. I didn’t sleep for days, avoided vents, bookshelves, cupboards, closets, the corner of any room, and when I finally did succumb to the powers of sleep, I did so with the lights ON for many, many weeks. Sinking into the cushions of my theater seat I was frozen by this revelation, suddenly knowing what was to come on screen, with a clear understanding of how much it had affected me as a kid. I half considered fleeing the theater in anticipated terror. I stuck around and enjoyed the film, but it didn’t have a fraction of the effect on me as had the original (which, after a bit of internet research, I discovered to have been made in 1973). Yes, the new version has plenty of good scares, high production values, solid acting, and the talents of Guillermo Del Toro. But the new version attempts (quite nicely) to explain why these bloodthirsty creatures want to torment their victims. And once horror can be rationalized, it’s really not that scary. Kind of like knowing the magician’s trick before he saws the lady in half. Don’t get me wrong, I’m an absolute stickler for good writing, and the new version of DBAOTD is definitely the stronger narrative, with lots of subtext and well-developed characters to drive the story and explain the behavior of the characters. A+ Guillermo! But, when it comes to delivering mess-with-you-mind scares, nothing beats the lasting impact of the unexplained. There are demons that live in the wall. They only come out when it’s dark. Is any other justification for being scared necessary?!??! If I were to go back and watch the original today (which I certainly plan on doing), I doubt it would have the same scarring impact on my mind. Then again, I now live in a very old house with all kinds of unexplained drafts, noises, hidey-holes, mystery doorways, and skeleton keys. Not to mention the pit in the basement. I’d love to hear your Forgotten Movie memories. What movies scared you so badly that the rest of the film was vanquished from your memory? Share! We can start a support group. Over the weekend I saw a new film, and as I sat in the theater watching the story unfold, I felt a shiver of dread rising from somewhere deep within my basement of dark childhood fears. You know the place. It’s where shadowy dangers lurk and prey, and whisper your name from within the closet and behind the drapes. It’s where the monsters live. And wait for the light to fade. Don’t kid yourself, the basement of terror is real. The iron clasped door may be locked by adult concerns and modern “fears” (money, mortgage, mortality and matrimony), but the frights we hold as children that pound and scrape with thundering fists and gnarled fingertips are far more terrifying than anything Hollywood can project upon our jaded grownup eyes. Oh sure, I was freaked out by Jaws to the extent that I now rarely go in the ocean, but that film merely ignited and fed a totally rational fear: there are things in the ocean that could eat me. Sure, the odds of becoming lunch are long, but I know that I can control those odds by not venturing into the Pacific, and once in the ocean the odds don’t mean a thing because eventually, for some unlucky swimmer, the wheel is going to hit double-zero. It’s totally rational to believe that lunch-Lotto could be as soon as my next splash past the breakers. Childhood fears are special. They are rooted in irrationality and grow more vivid when fed by an overactive imagination. Moreover, the fears we have as children have the potential to seriously mess with our minds, biding their time in the protective depths of our psyche, just waiting to bubble on up to the surface for an adult nightmare or two. Motivated by the resurgent childhood fear I felt in the theater Sunday afternoon (and we’ll get back to that specific tale of terror in a moment), I decided to put together a collection of blog posts about all the things that terrified me as a child. I even made a list, which was great fun! Strange though this may sound, I actually treasure my childhood fears. Sure, they were cause for many sleepless nights with lights a-blazing, but they’re mine… just like the unique collections on display throughout my home. They also likely explain quite a lot about the odd stories I tell through my photography. 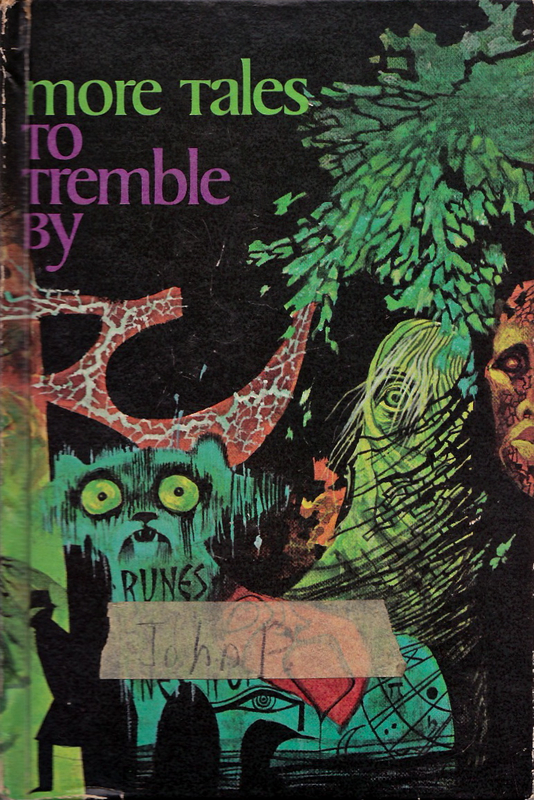 At the top of this post is a book cover, More Tales To Tremble By, published in 1968 by Western Publishing and containing a selection of horror fiction edited by Stephen P. Sutton. I’d like to tell you about the stories inside, but I can’t recall any of the “trembly tales.” In fact, I’m not sure that I ever got past the cover. Not the front cover, as seen above (which I immediately labeled as mine with a strip of masking tape), but the back cover. So which is scarier? Most would immediately point to the creepy cat, the rotting ghoul, and shrunken head staring forth from the front cover and understand my little kid fears. I was absolutely frozen with fear every time I saw those bloody fingertips reaching from the (surely!) 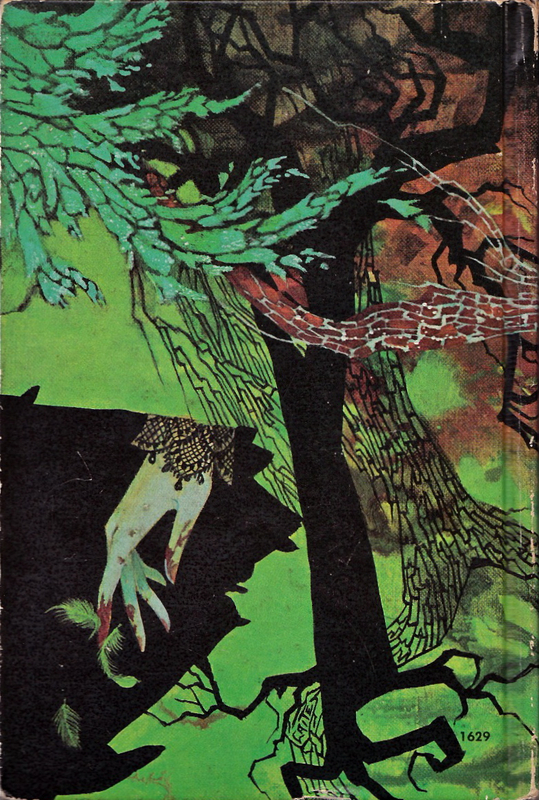 dead woman’s Victorian sleeve on the back cover. Worse, my sisters knew this image scared me and they tormented me with the book. If I turned it one way, they flipped it the other. If I hid it away, they’d find it and place it somewhere that I’d find it. They went so far as to place the book (years later!) in my luggage when I went away to college. What scared me about the bloody hand? I think it was the way the fingers dangled, all pointy and purposeful. They were reaching… reaching… reaching… FOR ME!! At some point, not so long ago and well into my adulthood one of my sisters found a copy of the book and surprised me with it as a gift. Of course, little did my sister know, I still had my original copy, safely tucked away on a bookshelf. With the bloody hand unseen against the wall. I think I may read a story or two from More Tales To Tremble By and report back. I’ll live… maybe. Coming in part two — what I saw in the theater on Sunday to chill me to the bone. Thought I’d share a quick Halloween photo with everyone as I wait for trick or treaters to line up at my door (a long wait, as my street does not have sidewalks and I have no pumpkin out). I took this picture of my candy bowl in the front entryway of my house. In the background is a wonderful painting by Ana Bagayan titled, The Irrationality and Inevitability of Being a Puppet, while in the foreground there stands a headless doll. 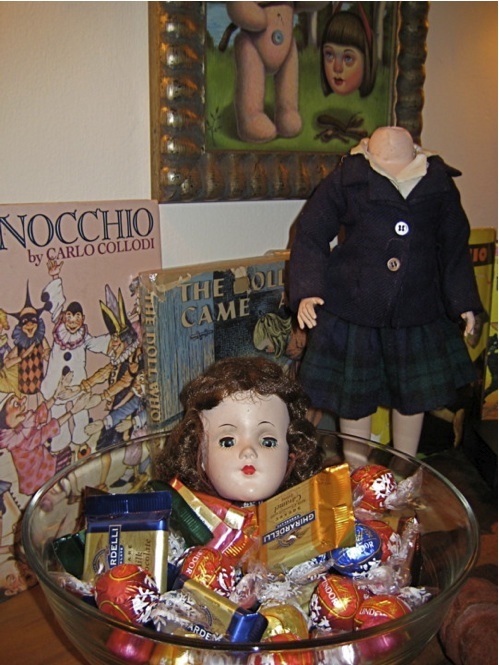 Now, don’t go thinking that the doll head in the candy bowl is usually on the doll body. Noooooooo… The doll head usually sits atop the Pinocchio book on the left, ready to greet any visitor to my home. Tonight, it’s sitting in the bowl, ready to haunt the dreams of any trick or treaters. And if you tilt the bowl just right, offering the bowl to the unsuspecting and impressionable child, the dolls eyes are peacefully closed. Ah! But with the slightest turn of the wrists, her glassy eyes slowly roll open to horrify the tiny tikes, just as their little fingers are about to grab a sweet bit of candy.